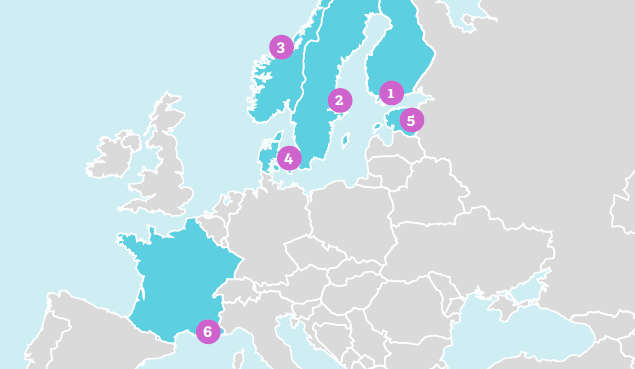 The SECCLO consortium universities are renowned research and educational institutions in Europe, and among the top-ranking universities of technology in the Nordic countries. In our consortium composition, we rely strongly on the excellence of the partner universities and on their close ties to the industry in their home countries. The consortium universities are accustomed to respond to the needs of the relevant industry and there is a significant scientific and industrial cluster in this subject area. The location of many of the universities near science parks, innovation hubs, and R&D centers support various formal and informal ties between the educational institutions and industry. For example, Aalto University is located in Otaniemi knowledge hub which is home to 800 companies. EURECOM is located in Sophia-Antipolis, Europe’s largest technology park with more than 2000 companies. The associate members of the SECCLO programme promote the future employability of its students by offering internship and thesis positions, company visits and contributions to the course contents. The associate members are also committed to supporting the further development of the programme by nominating representatives to the SECCLO Advisory Board. NordSec is an annual research conference series that has been running since 1996. The event brings together security researchers from the Nordic countries, Northern Europe, and beyond. In addition to being a venue for academic publishing, NordSec is an important meeting place for the university faculty, students, as well as industry researchers and experts. The conference will be part of our academic activities as students participate in the poster competition. NordSec offers an excellent opportunity for networking and gaining new information and knowledge in the area of SECCLO studies. NordSec 2018 will be held in Oslo, Norway. Helsinki-Aalto Center for Information Security is a strategic initiative set up by Aalto University and the University of Helsinki in June 2016 to ensure excellence in information security research and education. HAIC aims to create a network of industrial partners to support research and educational programmes in information security. Several companies have already joined HAIC. HAIC networks and contacts will benefit SECCLO programme, students, and staff, too.